Cubans, with such success to the Cuban arms as to arouse general sympathy throughout the United States. From various sources here the Cuban patriots received material assistance, which was known to the Spanish government and so enraged certain of the loyal Spaniards, residents of Cuba, that the lives of the American consul. General Fitzhugh Lee, and Americans on the island, became imperiled. 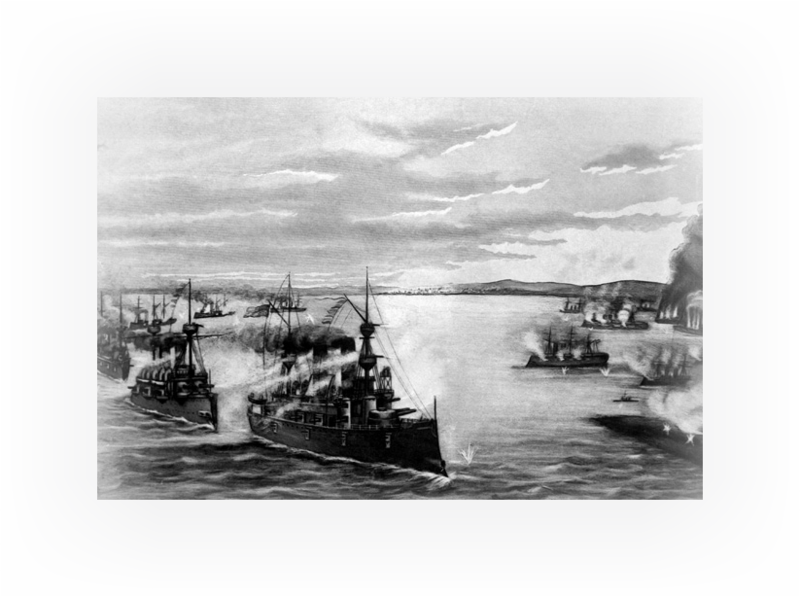 To increase the bitterness between the liberty loving people of the United States and the blood-thirsty Dons, a magnificent war vessel, the Maine, was blown into fragments while in the harbor of Havana on a February night in 1898. This so aroused the war spirit throughout the length and breadth of the Union that the McKinley administration was practically forced into a declaration of war against Spain, it being taken for granted throughout this nation that the destruction of the Maine was the inhuman handiwork of Spanish sympathizers; hence, it was, that on the 23d of April, 1898, President William McKinley issued a call for 125,000 volunteers to assist the regular army and the Cuban soldiery to whip the Dons and drive them forever from American soil. The Student of history well knows that for many generations the inhabitants of Cuba had been struggling to rid themselves from the Spanish yoke and establish autonomy on the island. In 1897 many bloody skirmishes had taken place among the islanders and Spanish troops, all in the nature of guerrilla warfare on the part of the Spanish. Five days later, on the 28th of April, Company C of the Second Regiment of Wisconsin National Guard, including a number of volunteers, numbering in all 155 men, went into Camp Harvey at the Wisconsin State Fair grounds near Milwaukee, where, on the 12th of May, they were mustered into the United States service as members of the Second Regiment Wisconsin Volunteers under the command of Colonel Charles A. 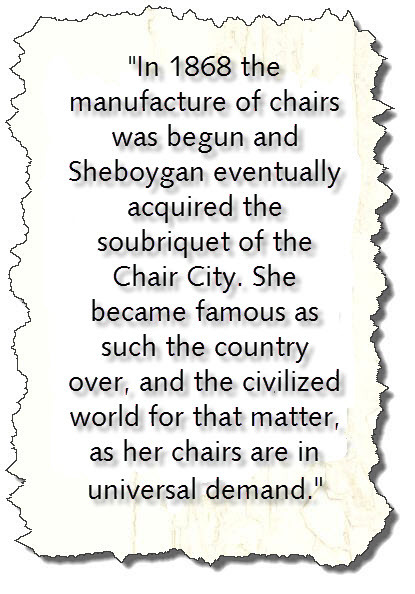 Born of Sheboygan. On the 15th of May the regiment was en trained and on the 17th arrived at Camp Thomas in Chickamauga Park, near Chattanooga, Tennessee. On the 4th of July, orders were received to proceed to Charleston, South Carolina, and after a march of ten miles to Ringgold on the following day they boarded the cars and arrived at their destination on the 8th. 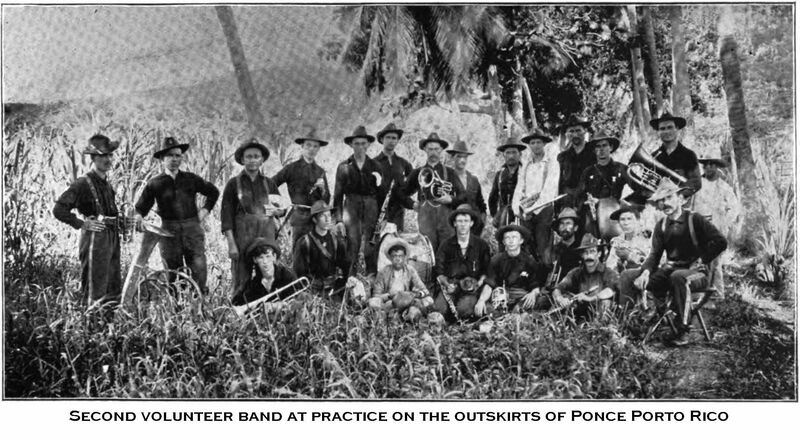 On the 21st of July the regiment left Charleston on the transport "The Grand Duchess," for Porto Rico and arrived at Ponce, the largest city on the island, on the 28th. On the 1st of August, the company became part of an expedition under the command of General Stone, chief of the Signal Corps. The conquest of Porto Rico from a military standpoint was practically a bloodless affair. There were a few engagements and some lives lost but in none of these was Company C represented. However, the organization experienced many hardships. It was in a strange country, in a foreign land, and a climate that breeded for the alien malaria and other diseases. The men were also on short rations, which consisted chiefly of hardtack, "sow belly" and unsweetened coffee. 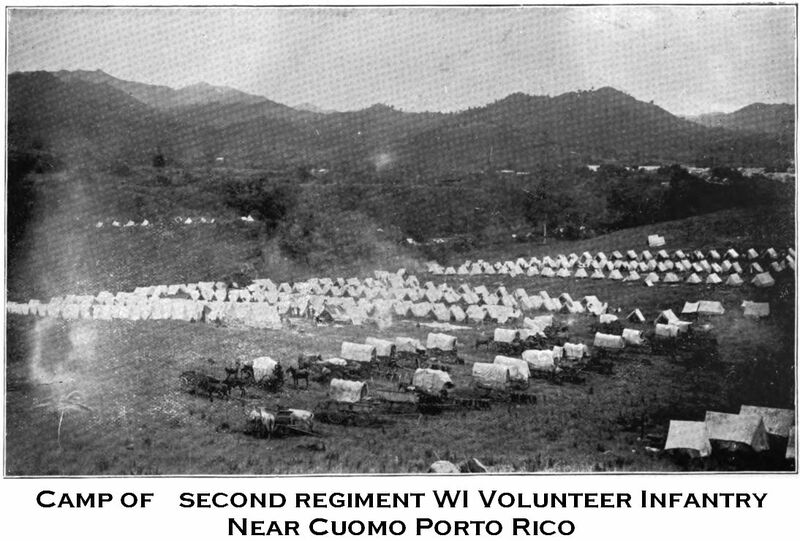 These conditions generated a great deal of sickness in the camps, and were the primary causes of the death of Willie Trier, a member of the regimental band, who died in a hospital at Ponce, and Albert Doege, who died shortly after his arrival in Sheboygan, at the home of his parents, from a disease contracted in Porto Rico. The regiment left the island on the ist of September and arrived in the harbor at New York on the 7th. Two days later they were received with open arms by a multitude gathered in Sheboygan to welcome them back to their homes. It was a great demonstration. Speeches were made by prominent citizens, bands played patriotic airs and to top it all off, a magnificent spread was served that was certainly relished by the men who had been regaled for so long a time on hard tack and salt pork. There is now in the city a Spanish American war veterans camp, which was named in honor of the two boys who gave up their lives for "Cuba libre," Comrades Doege and Trier. Doege-Trier Camp No. 66, Frank Kempf, quartermaster, meets the first Friday of each month at Modern Woodman Hall. Colonel - C. A. Born. Batallion adjutant - Ullrich Moeckli. First lieutenant - Charles Bodemer. Second lieutenant - Herman Olson. Quartermaster sergeant - A. J. Schultz. Sergeants - Nicholas Thill, Otto Burkart, Otto Herhold, George Herwig. Corporals - Emst Schroeder, Theodor Mosch, Fred Roberts, William Kirst, Henry S. Geube, Frank Gleich, Philipp Krummenauer, Herman Schmidt, Henry Balke, Otto Fiedler, Ivar Lohmann, George Mead. Musicians - William Braband, Louis Kazilleck; Company A, John P. Janett, who was from Sheboygan. Wagoners - Julius Scheffler, William Cook. Hospital stewards - Dr. O. Amdt, Dr. O. B. Bock. Henry Johnson, director; Frank Kroeff, William J. Trier, Adolph Markworth, Albert Bohm, E. Billet, Henry Eberling, Oscar Hensel, Herman Nagel, George Johnson, Joseph Nussbaimier, Frank Kempf, Ferdinand Wetzel, Charles Neumann, Ambrosius Jaschinski. Joseph Baldewein, August A. Brockmann, Joseph Baumgaertner, Henry Buchen, George Brasure, Theodor Ben fey, Frank Burkart, George Barber, Henry Boyle, Paul Birr, Anton Bebin, William Boll, Willard Cole, George Cole, Andrew Cliquenoi, Charles Cone, William Cook, Charles Dezbales, Albert Doege, Charles Dins, Edward Eiles, Henry Elwell, Ferdinand Eisold, Joseph End, Oscar Frank, Jacob E. Franey, Henry Fleischer, Herman Grasse, James Glines, Charles Garmer, Fred Goehring, William Guenther, Ed George, Gust Grunke, Ferdinand Guhl, Ed Heronymus, Henry Henkel, Peter Hertel, Nick Hirt, August Holtz, Arthur Hoberg, Frank Hertensteiner, Henry Hannahmann, Adolph Heronymus, John N. Jensen, Andrew Jacket, Louis Kerber, William Kappers, Edward Knocke, Henry Krummenauer, Ed Kircher, O. L. Krueger, Carl Kohler, Charles Loerke, Charles Lovelace, Louis Loeweke, Aaron Lokker, John Leonard, Fred Lappe, Edward Look, W. Ladenberger, Charles Mussil, Louis Magnus, Joseph Marwar, Alfred Moser, Joseph A. Mallmann, A. P. Mallmann, Oscar Neumeister, Louis Oehler, Charles Pagelow, John Plath, Gustav Pawasarat, Fred Pagelow, William E. Rodriguez, John Radinski, Gustav Rosenau, George Ryan, Louis A. Rosenthal, Herman Rakow, August Radke, Alex Schubert, John Stranberg, William Schmeichel, Herman Schwarz, August Strassburg, Charles Strassburg, Henry Stielow, Charles Synold, Fred Steinberg, Albert Schneider, Peter Spieles, Charles Seaman, Hubert Stecker, Charles Scheffler, Emil Schutt, Herman Schmidt, Herman Steinfurt, Fred Schild, Theodor Stade, Ernst Stahl, William Steifen, Arthur Steifen, George Schroeder, William Tomaschefsky, Fred E. Voigt, Fred Wedegaertner, Harry Williams, George Wudy, Waker Weisse.